PLEASE NOTE: If you would like to book within 24 hours of departure, please contact us directly on +61 (473) 770416. If you would like to join our Seal & Ocean Expedition to see the beautiful coastline of Tasman National Park with its abundant wildlife and the seals up close, but aren't too keen to jump in the water, you're welcome to come as an 'observer'. Besides super cute seals and other wildlife that we come across on the day, we will show you some amazing caves, sea stacks and cliff formations. At the seal colony, you can recharge with homemade tea and biscuits. 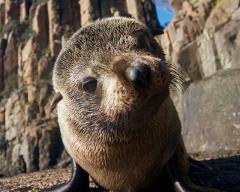 Departures: Sun - Fri, October - June, at 9am @ the Wild Ocean Tasmania HQ, depending on weather and ocean conditions. (Additional departure times during high season). On this 2 hour boat trip we take you along the impressive coastline of Tasman National Park between Eaglehawk Neck and Cape Hauy, part of the new 'Three Capes Track'. 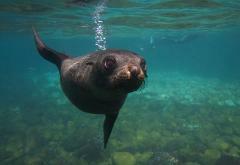 With our small, adventure-style vessel, we can nose deep into colourful caves and get you within a whisker-length of cute fur seals. Look out for rare sea birds, fins or blows. Dolphins and albatrosses are a common sight on our trips. 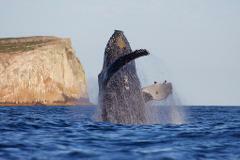 Southern Right and Humpback whales migrate past our coastline between the months of June and December. If there is a chance to see something special, we're always up for a detour to give you the best photo opportunities and to make your time with us an unforgettable one.